Melanie Dillon is always the bridesmaid. 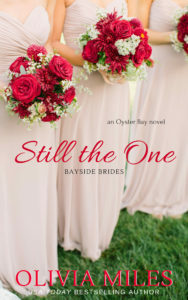 She’s also the wedding dress consultant, inevitable crisis manager, sometimes cake tester, and reluctant therapist to all the brides who come through the doors of Bayside Brides in downtown Oyster Bay. And after years of standing back and watching other women find their happy endings, she makes a promise to herself that this year, she will be one of them. With her brother’s wedding approaching, she sees an opportunity to expand her business and finally shed those last few (okay, more than a few) pounds she put on since chocolate and wine replaced her no-good boyfriend a year ago. But when her ex snags an invitation to the event, Melanie turns to her best friend to pose as her date. Back in town to take over his retiring father’s medical practice, Jason Sawyer is sweet, smart, and reliable. He’s also been in love with Melanie since they were kids—not that she ever noticed. Now, with a second chance within reach, he has to decide if he will admit his feelings or move on for good. All Melanie wants is the same promise she makes to her clients every day, but when professional and personal plans collide, she realizes that happy endings don’t all come in the same form, and that sometimes, the life you thought you wanted isn’t nearly as wonderful as the one you already have.